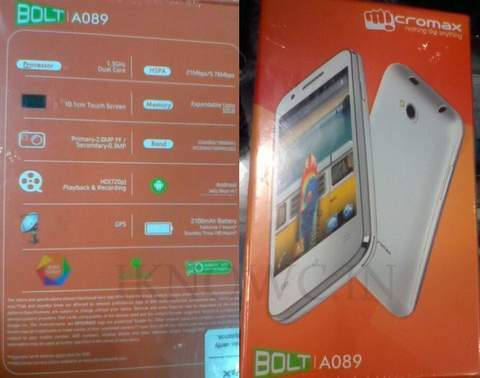 Micromax A089 Bolt, probably the company’s latest and upcoming smartphone has been spotted online. The new Bolt A089 comes with entry level specs and would be priced under RS 6,000. The handset in Bolt series are usually affordable but comes with basic features. The company has not announced yet, but an unofficial Micromax-Canvas Blog has showed some images of the retail Box of the A089. It has 4 inch (10.1cm ) capacitive touch screen of unknown resolution, as not specified on retail box although it would be 320 x480 pixels. It draws the power from 1.3 Ghz dual core processor coupled with 512MB of RAM. Thanks to the battery of the phone, which is of 2100 mAh and should be enough for a 4 inch display. It runs on Android v4.2 Jelly bean Operating system. The A089 packs with a 2-megapixel Fixed Focus primary camera and a VGA secondary shooter. According to the feature list on retail Box, the phone can record and play 720p HD videos. It has 3G, WiFi, GPS and HSDPA+ 21 Mbps. The Micromax A089 Bolt would be launched officially in Next month and it would compete with other Mid Ranged phones in India.